When we think of ungulates or hoofed mammals, the image which comes to mind is usually that of a plant-eating animal with a relatively small head and grinding teeth. This highly generalized description accurately describes most ungulates alive today. However, there once existed a group of fossil ungulates whose members possessed massive heads with jaws and teeth adapted for tearing flesh and crushing bones. These were the entelodonts (Entelodontidae). Entelodonts were medium-sized to large artiodactyls that lived in the Northern Hemisphere from the late Eocene to the middle Miocene. 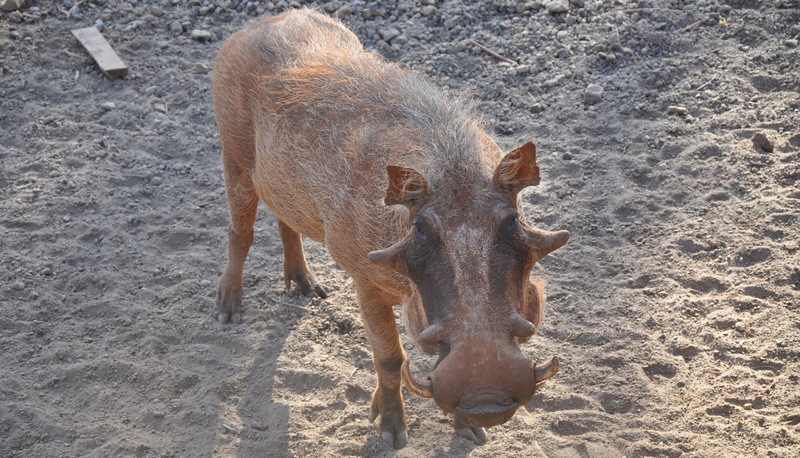 Certain aspects of their morphology have led scientists to traditionally think of these animals as close relatives of pigs and peccaries. As a result, entelodonts have often been informally referred to as “killer pigs”, “hell pigs” or “terminator pigs” among other misnomers. Recent molecular studies, however, have shown that entelodonts were actually terrestrial relatives of semiaquatic anthracotheres, hippos, and fully aquatic whales. Archaeotherium skull on display at the Buffalo Museum of Science. Wiki. The earliest known entelodont, Eoentelodon yunanense, is known from China by about 38mya during the late Eocene. The family reached its peak diversity during the Oligocene and could be found throughout every continent in the Northern Hemisphere. The last known entelodont, the giant North American species Daeodon shoshonensis, became extinct during the early Miocene about 19mya. The name entelodont, derived from the Greek words enteles and odontos, literally means “Perfect Tooth”, referencing the complete dental array of 44 teeth. Overall, entelodont dental morphology suggests that these animals were highly predatory in habitus but retained the ability to ingest plant matter (mesocarnivorous). The anterior dentition is adapted for piercing, gripping, and pulling. The well-developed incisors are pointed and are either rounded or sub-triangular in cross-section, ideal for puncture-and-tear feeding. The canines are very large, sturdy, and are serrated along their posterior edges when unworn. The large premolars are triangular in lateral profile, well-suited to gripping relatively large prey items. The robust molars have bunodont cusps for grinding and crushing. Skull of Archaeotherium mortoni at the Paleontology Museum of Zurich. A living entelodont would have appeared rather strange to a modern observer, in many ways resembling a large carnivorous peccary. Like peccaries, their elongated jaws were able to open incredibly wide thanks to a posteriorly-orientated mandibular fossa (jaw joint). The skull itself was very large in proportion to the body; comprising up to a quarter to one-third of the head-and-body length depending on the species. 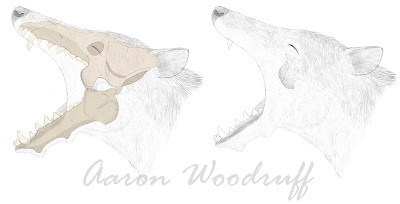 The snout is characteristically long and relatively narrow, although earlier genera like Eoentelodon and Brachyhyops had relatively shorter skulls than their later relatives. The posterior region of the skull then broadens drastically behind the eyes because of exceptionally broad with wide zygomatic arches and well-developed sagittal crests, indicating the presence of huge jaw muscles that would generate tremendous bite forces. to demonstrate the exceptionally wide gape. 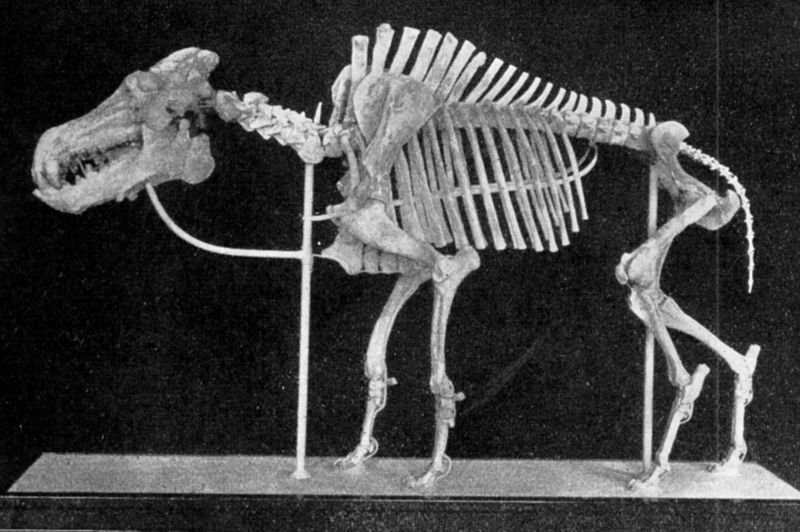 Perhaps the most unique aspect of the entelodont anatomy are the prominent bony growths which protrude from the skull and mandible; wing-like flanges flare out laterally from the zygomatic arches and two pairs of knobby protuberances extend from the bottom of the lower jaw. These structures are sexually dimorphic, being much larger in mature males and more modest in females and juveniles. In life, these structures were likely covered by thickened skin and would have served to shield vital parts head, such as the eyes and ears, from bite wounds during fights with other individuals of their species. Similar structures may be found on the faces of modern pigs of the genera Potamochoerus (bushpigs) and Phacochoerus (warthogs), although these projections are purely made of soft tissue with no bony core. 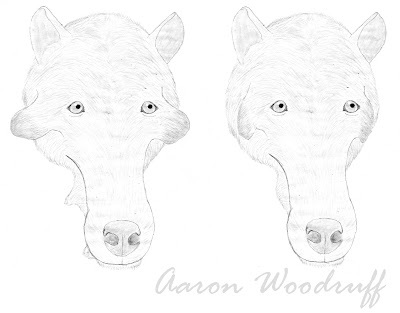 Reconstructed faces of male (left) and female (right) Archaeotherium mortoni. mandibles, which are notably larger and broader in mature male specimens. damage during intraspecific fights. Wiki. 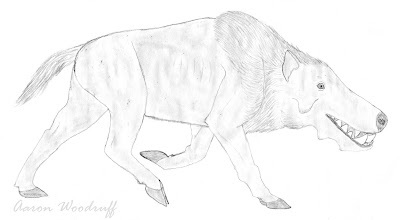 Although entelodonts ranged in size from that of a wolf to that of a bison, all retain the same general physical characteristics. Their necks were short and robust. Elevated neural spines on the thoracic vertebrae provided attachment sites for the large muscles and ligaments to support the weight of their massive heads, as well as providing the strength needed to subdue and transport prey items. The forelimbs were typically longer and more robust than the hindlimbs, placing the center of gravity over the shoulders. Such body proportions may be seen among modern bone-cracking hyenas and is associated with the ability to travel considerable distances while carrying large sections of carcasses. Entelodonts were built to run very swiftly, but they were not particularly specialized for cursoriality. Rather, they were probably best suited to travel at sustained, moderate speeds for extended periods of time. The limb bones were relatively long and slender with the radius and ulna fusing into a single bone in advanced species. The lateral toes were reduced to tiny splints of bone, leaving only the two central digits on each foot to bare the weight of the body. slender yet sturdy limbs with didactyl, unguligrade feet. Wiki. Life restoration of Daeodon shoshonensis, the last and largest of the entelodonts. have fed upon many of the larger mammals with which it coexisted. Bite marks and tooth fragments from Archaeotherium and Daeodon have been identified on the bones of contemporary camels, oreodonts, chalicotheres, and rhinos. Mass accumulations of prey species with tell-tale tooth impressions show that entelodonts kept meat caches, a behavior which is common among modern predatory animals. Excess food is transported to a relatively secure location and stored there to be consumed later, similar to how we might leave our leftovers in the refrigerator. A fossil trackway from Toadstool Geologic Park seems to depict Archaeotherium mortoni hunting the cow-sized rhino Subhyracodon occidentalis. 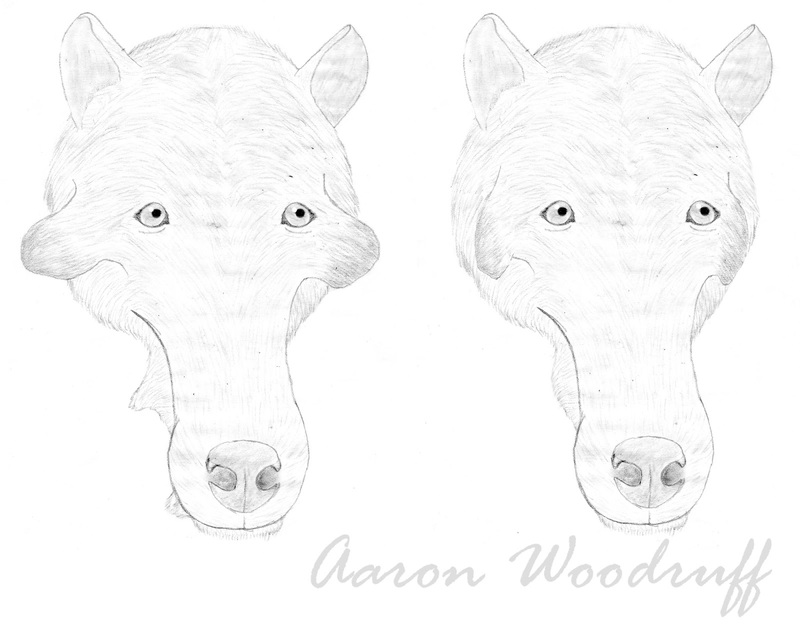 Entelodonts differ from other artiodactyls in having eyes that are more anteriorly-oriented, enabling greater depth perception and stereoscopic vision; a condition which can be found among most terrestrial mammalian predators. Furthermore, the olfactory lobes of the brain were exceptionally well-developed, indicating that the sense of smell was very important to these animals. The following animation, generated by WitmerLab at Ohio University, shows a 3D rendering of the skull and brain endocast of Arcaeotherium.